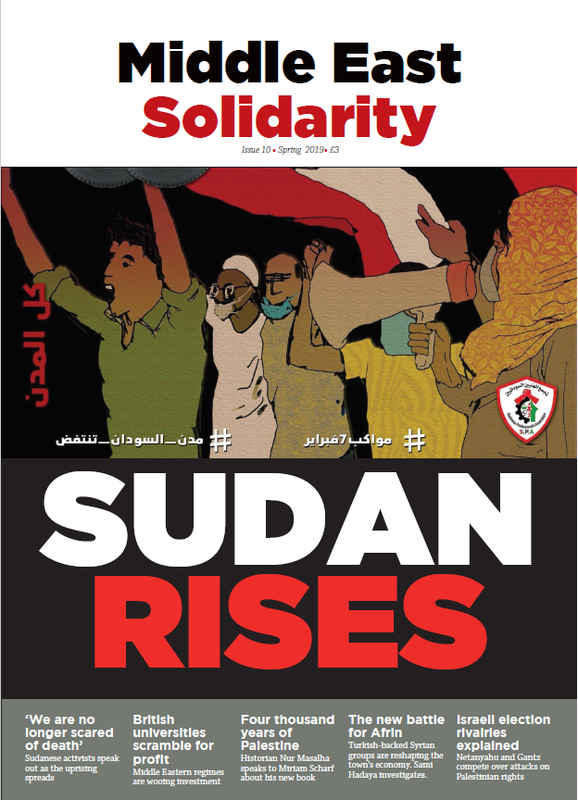 Middle East Solidarity magazine is now available to order from Bookmarks bookshop for £3 or can be downloaded as a pdf [MENA Solidarity issue 10_FINAL_WEB] Contact Bookmarks if you would like to make a bulk order for your trade union branch (discounts available). After thirty years of dictatorship and war, people across Sudan are on the streets demanding change. Irang Bak analyses the roots of the current uprising. Anne Alexander and Alice Finden explore how repressive regimes in the UAE and Egypt are set to benefit from universities’ overseas expansion while Ioana Cerasella Chis reports on how trade unions are challenging college managers’ drive to put profit before people. Egyptian activist Taher Mokhtar analyses the military dictatorship’s strengths and weaknesses.